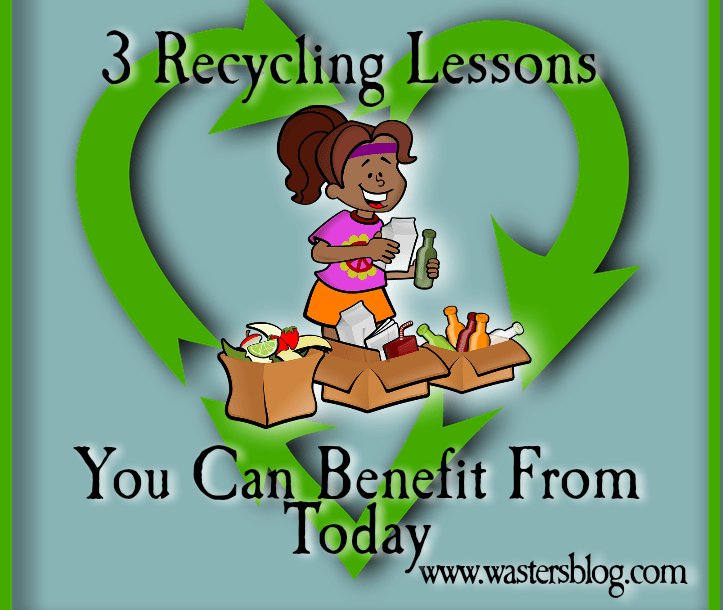 We bring you 6 mini Recycling Lessons you can benefit from today. In this article, we explain the main types of materials which you should be recycling from your own domestic household waste, and why it is important to make sure that you do separate these materials from your “residual” waste which for most people goes into a “black bag” so it is called back bag waste! In many nations recycling rates continue to rise, and since the Paris Climate Change summit in December 2015, more and more people are seriously concerned about their environment. But unfortunately, many people are still confused about how to do their recycling. Guess what! Be one of the educated recyclers! Read this page! Glass was the second type of waste which was recycled in many communities, after the recycling of clean waste paper began as the first recycled material collected in many communities. Most types of glass are recyclable, and each householder will have been given instructions at some time as to which types of glass to collect, and in what colours. Some councils ask you to keep some colours of glass separate from others, but in most cases householders should, rinse them out, and put all of their glass bottles in a separate collection box, and leave them out for collection with all their other recycled materials. b) A much reduced need to dig out yet more stone from ugly quarries, to make glass out of huge ugly quarries. Plastic is an important material to recycle, because if can be made into new plastic materials by mixing it with fresh plastic in many new products. It is made from a non-renewable resource, oil. Once the oil runs out, there will be few ways to make plastic, so it is important not to use up too much oil. In a similar way to glass, when recycled material is used much less energy, and water is needed, than for new plastic So, recycling plastic helps reduce the demand for new oil and water which is running short in many countries and regions of the world. Metals are wonderful for recycling because unlike paper, wood and plastic, for example, which each time become degraded. For example, each time paper is recycled into pulp the particle sizes of the fibre are reduced. Eventually, the paper fibres are so small that they can no longer make new paper. Recycled metals are elemental materials, they can be melted down purified and re-used an infinite number of times and each time the product they make is as bright, clean, and sparkling as the time before! Save and separately sort your metals, these include aluminium foil meal dishes, cans in all metals (especially aluminium and steel), and household tools and equipment, which when old and no longer wanted can simply be recycled with the rest of the metals from the house. Batteries in all their forms, should always be recycled, not only because of the materials in them which are valuable and can be re-used, but because sending them to landfill allows the toxic metals in them to leak out, and this pollution can sometimes get out from landfills and cause nasty pollution. It has been considered so important that batteries and kept out of landfills that the WEEE regulations require batteries to be returned to expert recycling companies which re-use the materials. That way they cannot escape from landfills and cause harm. Not only that, batteries like those in mobile phones can, if the phone is thrown into the “black bag”, end up causing harmful fires in the landfill. These fires are very dangerous for the people working on the landfills, and the smoke can cause major air pollution problems. Electronics is similar to batteries. If electronic equipment is thrown into a landfill via the “black bag”, many toxic chemicals can leak out. But, why waste you hard earned money by throwing your old mobile phone away at all? it make so much sense to sell your electronic equipment like mobile phones, and get some cash back on it. A good example of a mobile phones for cash website is Mazuma Mobile. In addition to the above reasons for not throwing away electronic equipment, recycling it make more sense because the rare-earths (chemical compounds) used in many electronic devices is finite in quantity, and many experts predict that some of these elements will run-out within our lives if this material is recycled. Paper products are the original recycling materials, and the idea that lovely forests are being cut down, never to return in their original form, just so that we can ready a newspaper for fifteen minutes, and then litter the environment around us with the stuff, is abhorrent to most people. Place your newspapers, magazines, discarded office papers, envelopes, junk mail etc., into a paper recycling box, and put it out on recycling weeks for the refuse collection service to collect. However, before you even throw things away, there is a lot that the general public can do to minimise the amount of waste they produce, by re-using things. This is more beneficial to the environment than recycling, because the energy and materials used are almost nil. Examples of re-use are bottles which can be re-used and used again for storing things like “how-brew”, newspaper which can be used for wrapping things, plastic food container which can be re-sued as “lunch-boxes” etc. Recycling Lessons in Conclusion: Now You are Educated in Recycling! With a little bit of ingenuity you can re-use quite a number of things which would otherwise have been thrown away. The big advantage here is that you can save money directly when you do this, as well as helping to preserve the environment. We hope that this article has helped you to understand what to recycle and why it is so “green” to do it. The nations of the globe got together to save the planet from runaway global temperature rises at the Paris Climate Change Summit in December 2015. Now that all nations have agreed to pull together to fight climate change, all the peoples of the world are now co-operating to reduce the temperature rise. In many things the average person is unable to influence the carbon emissions each of us produces. We have to get to work, and we use public transport, for example, but as individuals we must work so our choices to be “green” are very limited. This is not so when we consider recycling, because we can all make sure that whenever we eat and produce rubbish, whenever an item is recyclable, we ALL can make a difference by recycling it! Now. Please do visit the eco-energy website for more information about being green in your energy use. End of Landfill in the UK? Is Zero Waste Really Coming Any Time Soon?